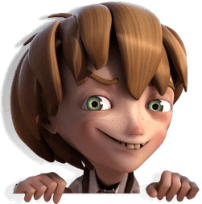 Jack and the Beanstalk - Probably everyone knows the famous fairy tale about Jack and his adventures in the country of giants, where he appeared with the help of a magic bean. 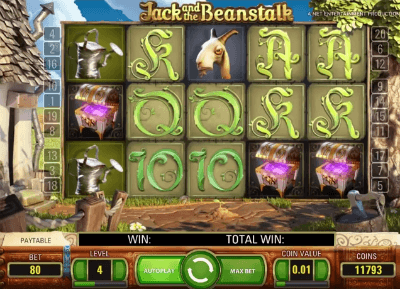 NetEnt, the legendary among casinos games manufacturer, has come up with a way to return Jack to our hearts, and the treasures of the giants to our wallets. On a basis of this tale was created a slot called ‘Jack and the Beanstalk’. What is the main advantage of this game? The first thing that immediately draws the attention of the player is incredible graphics. The manufacturer has paid much attention to the story, so the initial video and video inserts in the game are very impressive. Naughty boy Jack together with you will take the path from the gate of his house to the treasury of the giants. The classical form of the slot Jack and the Beanstalk has five rows, in which it is possible to obtain twenty pay lines. Before you start to play and win, you need to set the desired number of lines, as well as to choose the bet. If you choose the manual game mode, not automatic, you will have the option to change the size of the bet at any time. In automatic mode, you should wait for the game to stop until the completion of the playing session. As a supplier of free spins, there are the treasure chests. Simply collect three chests together and you get ten spins. This appearance will change the location also: you will see how the beanstalk drags Jack into the clouds, where the treasures are hidden. If during the game on free spins you will be lucky enough to collect the chests again, you get three more bonus spins! Another interesting feature of the game is an unusual symbol: an inscription with the name of the slot. As soon as this symbol appears on the screen, it starts with each new rotation to move to the left until the rows are not over. This feature acts as a moving Wild symbol. All spins that the drum will produce until the chip moves across the screen are free. For those who want more bonuses: all the winnings obtained by the Wild symbol triples. In the last row, you can collect bonus symbols; there are nine of them in total. 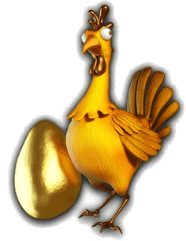 For every three of them, the player receives various prizes, including the legendary golden goose. Playing this slot is very pleasant thanks to the unobtrusive music, decent graphics and high probability of winning. Available on PC, smartphone, and tablet.